The same quality work and relationship-building that propelled Anpec ­Industries Inc. out of the 2008 U.S. ­market collapse into the highest sales of the company’s history is what earned them the Rockford Chamber of Commerce’s Manufacturer of the Year award for 2016. 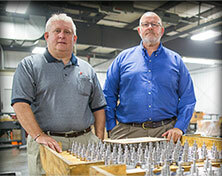 “We saw the companies that do exactly what we do go out of business and we were able to pick up customers and grow,” recalls Doug Allen, co-owner of the 26,000-square-foot CNC machining and manufacturing facility with 45 employees. Anpec’s humble beginnings date back to the 1940s when George ­Anderson combined his name with Pecatonica’s to start his 5,000-square-foot one-man general machine shop. He sold out to three brother-in-laws in 1968. In 1993, they recruited Allen to take over. A year later, Anpec’s co-owner Brad Wagner, a former service rep for Mazak Corp. in Schaumburg, was brought in. Today featuring 25 pieces of Mazak CNC equipment, including multiple axis lathes and vertical and horizontal multi-pallet machining centers, Anpec caters to industries such as heavy equipment, agriculture, energy, food and beverage, recreational, automotive, medical, military and aerospace.